Well last year we put on quite a show for our competitors and fans at the same time. 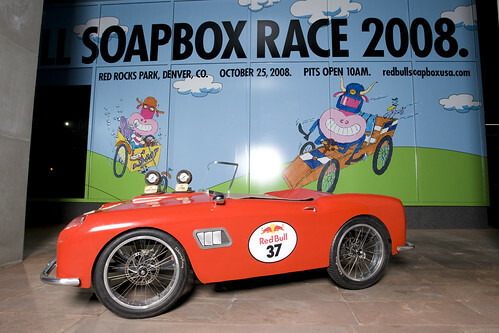 People could not believe the vehicle that we created when we went to Red Rocks last year to compete in the Red Bull Soapbox Race. Hell, we couldn’t believe it either. I mean, we built what I would consider, an exceptional replica of the Ferrari that we intended to build. No, it wasn’t to scale and no, it wasn’t completely accurate, but the final product is pretty damn nice looking. This year we knew we had to do it again. We saw that the options were to go to Georgia or to LA and immediately jumped at the opportunity to compete against Hollywood. In our minds LA was going to be us competing against Custom car builders, custom motorcycle builders, Art Center, Hollywood production companies and the Hollywood elite. Imagine the budgets!? Imagine the creativity and the craftsmanship! Man we have to step up our game! We met with some ideas. What car is going to get us to the podium? Which car is going to top the Ferrari… To be honest We decided that no car could top the Ferrari. I mean, the car, the movie, the scene and running the car backwards…it really was pretty amazing. So what car could we do that would come close? We had some ideas! The question was, could we build a car that we didn’t think looked as cool, but had better story lines, or do we build the ultimate of awesome cars? The decision wasn’t too hard for us to be honest. We like cool cars, so we chose the Mach 5 from speed racer. This car also gave us another possibility: the opportunity to do a female mold for our fiberglass layup! We applied to the race and we were accepted approximately 2 months before the race. It all began so quickly and we got involved very intensely. We build a chassis with bent steal and nicely machined steering, the chassis went together smoothly, but we soon realized that we had selected tubing that was simply too heavy. So back to the tubing bender we went to build it all again. We then shaped a plug for our mold. We started by cutting everything out on the waterjet and moving on to hand shaping, bondo and sanding until it was all perfect(ish). Onward and upward we laid up a fiberglass female mold which we pulled, did a lot of finishing to, bolted back together and laid up fiberglass for our final body. This all sounds simple when you put it into a paragraph, but we are talking hundreds of hours of work. I am guessing that each of us had over 300 hours of work in this car! In addition to all the work, we constantly came upon things that were going wrong. People who build cars know that some cars will fight you the whole time. The Mach 5 was one of those cars. Every time we thought we had it, something else cropped up that would cause more hours, more time and more frustration. We finally got the car in paint and put it into our trailer approximately 14 hours later to drive off to LA. The vehicle was still tacky when we put it in the trailer and the finger prints we put in it flowed out as we arrived in Las Vegas. We got to Vegas and decided that applying the decals should be done in a nice prominent location. Where could we do it? How about right in front of the “Welcome to Fabulous Las Vegas” sign? So that is where we put them on. People watched and people asked questions. We love to show off our work and this was a great opportunity. We left Vegas with LA in our sites. We arrived at the event at 4:45am on Friday Morning. News agencies were expecting several teams for the morning news and we were one of the teams that would be interviewed. Our vehicle was sitting in the dark as the other teams arrived. Crews were inflating Red Bull Arches on a big stage and putting the final touch on things that would be seen on the news. We were excited to meet some of our competition. This is a friendly race and we had been keeping an eye on a lot of the teams. Most teams post photos or videos of their vehicles progress and some were pretty intriguing. One of the first teams we met included fabricators from Overhaulin’. Their vehicle was pretty awesome and that was the moment we knew we were going to have to work hard for this one! That evening at the Drivers meeting we met a lot of teams some from various production companies in Hollywood, one was from Pixar. UCLA and many of the colleges locally had teams as well as Custom motorcycle fabricators, Troy Lee Designs and plenty of other people who had a long list of credentials. I was psyched that nearly every team that I spoke to was gunning for us. They would tell us how they have been keeping an eye on our photos and videos. One team even said that they learned everything they know about working with fiberglass from watching the Ferrari Build! I can’t think of a bigger honor than to be the team to beat! We had some great conversations about the trials and tribulations of the vehicle builds. 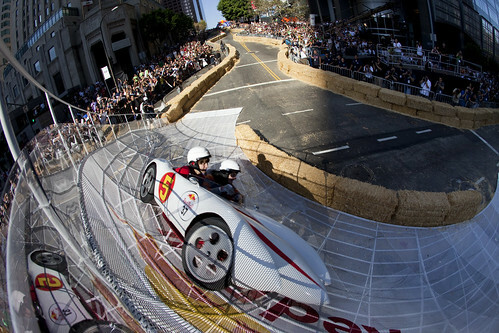 It is a funny place to be when something as trivial as a SoapBox race is the main focus of conversation. Everyone had been so involved in the build for so much of their waking lives for the past few weeks that it was about all anyone could think about! As the night came to a close we headed back and prepped for the event. Early in the morning we headed up to the venue to prep our area. We put up display boards and got the car ready for the day. People began to gather and we took on our roles. We were pinned to our booth all day. The crowds were in love with the car and as the people’s choice voting it was clear we had a big following…however it wasn’t clear to everyone. At first the voting was switched! A vote for Team Speed Racer was showing up as a vote for Team Moustachios. We were nervous as we saw their name rise up on the board with over 25% of the crowds vote. Soon things were switched back and we started showing up on the board with or percentage growing. It was clear that the people loved the Mach 5! The crowds subsided as we headed up to the stage. One thing led to the next and we were ready to perform our skit. We arrived on stage looking for our interviewer but Paul Rodrigues wasn’t anywhere to be found. We had seen that teams were either getting an interview or their intro video was being shown. So we heard announcers talking about our team and looked up to see our video only to realize that our skit music was playing! We scrambled to catch up, we tried to recover but in the end we simply had to push the car and walk away with our skit in shambles. The crowds greeted us on our way down the hill. It was clear that we made an impact and that people were going to remember our vehicle. Awards began and we were selected as the clear winner for the People’s choice award. It was a great feeling. We were one of only a few teams that were not from California. So to come in from out of town and have the popular vote, well that is pretty awesome. We were then selected for 3rd place. I was pleased with third. I mean with how much we had botched our skit it was pretty nice to be on stage again. In the end we made some great new friends and had an amazing time. Our vehicle has been put into the Forney Museum of Transportation and has been a hit with the young and old alike! I can’t believe the amount of attention the vehicles have generated, but I am glad, because we put our heart and soul into its creation so it is nice to sit back and see it turn heads!